I like to think of a diastasis that has resisted closure like an open zipper. An open fly affects more that just the zipper, it strains the button above, it messes with the fit of the pants, exposes things not supposed to be exposed, etc. 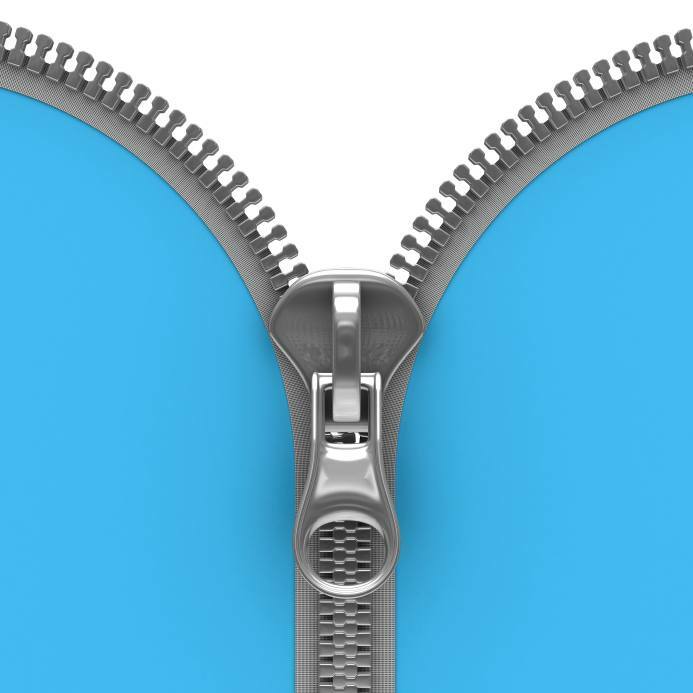 Addressing your zipper may need a multi-tiered approach to re-zip: shimmying up you pants, laying on the bed for a reclined, gravity assisted assault, jumping up and down, etc. A multi-tiered approach to a diastasis is also necessary to zip it up! It is important to understand that an opening in the abdomen impacts more than just the abdomen. The diastasis affects and is affected by breathing mechanics, continence, alignment, central stability, movement control, fitness, etc. So just doing specific abdominal exercises or wearing a brace on your abdomen will be hard pressed to close the gap or address those other systems. 2. Many post surgical and diastasis rehab program websites show before and after pics. Bellies get zipped and definitely look flatter, but so do the bums. Ladies, do not sacrifice your arse, for your abdomen. Your bum is a really important counterbalance for your abdomen. (And a great friend to you pelvic floor). To promote a closed fly, it is important to train them together, not with separate abdominal or glute work. One of the key ways to do this is be conscious of your alignment while exercising. It’s not just the pelvic position we need to be aware of, though it should be untucked to optimize the glutes. But rib cage position is key! It should live over the pelvis to help balance the forces, pressures, and appropriate recruitment of the front (abs), back (glutes), top (diaphragm) and bottom (pelvic floor). Check out this clip for some tips on optimum alignment to keep your fly closed. 3. I encourage my ladies to challenge the abdomen on exhale ONLY as they begin their programs. Exhale is the position of closure of the abdomen, or it should be. The abdomen comes together and moves in on exhale: a closed fly. This is a great position for a challenge or load!! By contrast, on inhale the abdomen should open or give to allow for the breath in. Please don’t challenge your abdomen then! Also, please don’t hold your breath on any exertion. This added pressure from the inside opens your fly and then the added load of the exertion will further separate the opening. 4. I teach my ladies to “blow before you go” . This cue is meant to encourage them to start the exhale BEFORE the exertion begins. This kicks up the deep stabilizer muscles (pelvic floor and TA, see a clip), fascial tension, and approximates the abdomen, all before the exertion begins. Your center is prepared for loading, and the diastasis is protected. Continuing the exhale throughout the exertion will help to maintain diastasis closure throughout the activity. 5. Always check your fly during and after exercise to be sure closure has been maintained or improved as you do you work. If your fly is more open, re-assess your program, strategy, form or get help! Ok ladies! Check your fly! Pursue integrative ideas for a whole body solution to your diastasis (Like this). Oh, and watch for toilet paper on your heel, too. Lions, Tigers, High Heels…Oh My! Hi Julie! Thanks for this article. I have had unresolved diastasis for 25 years. It was not identified after my last pregnancy and I had no idea until a few years ago that it even existed. I only became aware of it during training to be a yoga teacher but even then there was not a lot of specific guidance. Since following the work of Katie Bowman I have begun to see some of my habitual and compensatory movement patterns that clearly aggregate and perpetuate the problem and am now working to change those habits. Your tips have been very useful. When speaking to my GP I was told that at this stage about my only option was corrective surgery which I really don’t want. Is there a chance that I can repair or at least improve the problem if I continue to work with it or has it gone on too long to expect much change? Thanks for your question! It is a tricky one. First, I never say never, the body and brain blow my mind every day! They are incredibly resilient and capable of change even years after a problem has begun.You have already seen improvement with the work you have begun, that is a good sign. However, there are some issues with diastasis that can compound a resistance to closure, specifically the status of your abdominal fascia. This is the midline insertion point of all of the abdominal muscles, and is a lot like the flexible, spider-weby stuff when you pull apart raw chicken. This flexibility in the central fascia made it possible for your abdomen to grow while you were pregnant. But in some cases it thins so much that conservative measures may not be enough to pull it back together again at the center. However, our thinking has changed on what is considered a successful closure. It used to be anything greater than 2 fingers width was considered a problem that required intervention (conservative first, before surgical). Now, we assess how well the abdomen is functioning even with a larger gap as more the rule of thumb. As the blog indicates, and as you have discovered, there is much in our daily routines and fitness habits that can contribute to maintaining or worsening a midline gap. So I do believe that addressing those factors can lead to improvement. I would highly recommend checking in with a practitioner in your area that specializes in these issues to see if there is more you can do to work towards a high-level of abdominal function (in spite of gap width). And they can help you make informed choices regarding conservative vs surgical care once they have seen you. Email me directly julie@juliewiebept.com and let me know where you are and I can help direct you to a practitioner in your area. Great article thank your sharing this information. Blow before you go is a great cue. I’ve never heard it before and I will definitely be using it for a simple way to cue the prep. Mahalo! Thanks Sarah! “Blow before you go” is my signature phrase! Works great for kids and adults to get that deep system engaged as a foundation to build movement and fitness on. Just a heads-up, one hiccup I have encountered with using it all these years is that some folks interpret that blow before you go idea to mean blow out all your air and then move. So just be sure that they continue that exhale through the exertion. Thanks for your questions. It is honestly a little hard for me to tell from afar what is going on for you based on this description. I will give you my experience tho, A LOT of women are incorrectly labeled anterior pelvic tilt. The position of the rib cage is not always adequately considered in the appearance of the lumbar curve. I noted this in the clip offered in the #2 section of the blog, there I give my take on ribcage positioning. A lot of women LOOK anteriorly tilted but they are actually in a bell rung up position that makes them appear that way. And this is usually over a somewhat tucked bum, so tucking it more would not be a good solution. Addressing the rib cage relationship to the pelvis is more important. I recognize this is yet another way of approaching alignment, I am sorry if it adds to your confusion! I know there are a lot of voices out there. But I can only answer your question from my understanding of things. The focus on just your pelvic position and tucking it on exhale is not what I usually teach. Maintenance of optimized alignment throughout an exercise rep is the way I approach things. I also don’t encourage pulling the ribs down to prevent thrusting as this tends to create abdominal engagement (primarily from the upper abs). This abdominal engagement tends to prevent the good, big full breath. And the upper ab engagement pushes the pressure to the lower abs and into the diastasis. A big no-no. Not trying to sound like a used car salesman, but that clip in paragraph #2 is from the webinar I created for women. It is online in the store of my website. I take women step by step through a system to restore that central stability system and how to achieve a better alignment that optimizes it. (It will be available as a DVD in May 2014, too). SO all my answers how to restore your center, be in optimized alignment and move into exercise safely are in that webinar! The system I share in the webinar also addresses incontinence ( a major focus) however, this is the same system I use to address DR. I hope that helps a little. Sorry, these are the tough questions to answer from afar without seeing you and your alignment. Find a PT near you that works with DR on the APTA Section on WOmen’s Health PT locator page online.